The mouths of our fellow-citizens contain today a true mosaic of metals and different materials posed by the dentists. All these materials used in modern dentistry are complex physicochemical compounds, for which technical qualities take precedence over qualities of biocompatibility. One counts sometimes more than 30 different matters in an oral cavity. Some apparent, others are hidden inside the dental roots, in the form of pivots or other screws. Certain metals are covered by ceramics or resins and are thus not visible. There exists in the public of confusions as for the denomination of these various materials posed in mouth by the dentists. I point out that there is mercury only in what one calls” still called ““amalgams leadings”. One should not thus speak about amalgams to mercury since it always contain some because that lets suppose that there would be some without mercury. These amalgams are sometimes called “leadings” however it does not have there lead in those. There is no mercury in all the other dental, metal reconstitutions or not, posed stops some by the dentists. 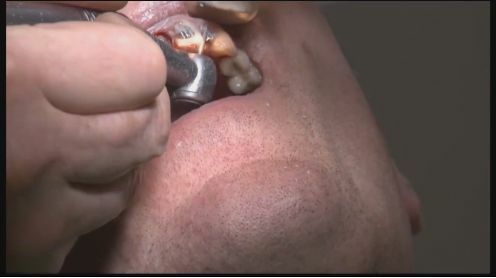 Precautions must be taken when the amalgams are withdrawn, but those are useless when one withdraws other reconstitutions like the dental crowns. The dental amalgam is a mixture of powder metals and liquid mercury used in the treatment of the carieuses lesions. It is less and less posed for aesthetic reasons. A dental amalgam contains approximately metal mercury 50%. The alloy powder is made up in variable proportions, of money (approximately 40%), copper and, in smaller proportions, other metals like zinc…). The amalgam is worked easily and hardens quickly. The amalgam has a metal colouring grisâtre. Sometimes it oxidizes and becomes blackish. Sometimes even, it takes a colouring gilded or reddish following an anodization by other types of metals in mouth. Today we know that galvanic currents can be created in a mouth, certain metals or alloys making anodes, other cathodes, saliva being used as electrolyte as in a battery of car. Thus metal ions move and can pollute our organizations. Sometimes near metal reconstitutions in mouth one sees on the gum of colourings grisâtres called tattooings and which are due to this migration of metal ions. In the case of the amalgam this migration can be due to the money. But that is not the fact that amalgam. For other metals stops that of it can come from chromium, cobalt, nickel, etc…. The mercury which it contains is a poison. The amalgam in spite of its technical qualities should not be posed any more in mouth and all the precautions must be taken with demounting not to risk a possible intoxication. If they should be withdrawn, a rigorous protocol must be applied. Their dangerousness is for me an established fact, but more because of their electromagnetic echo that presence of mercury. Many things were known as on this subject. There is necessary to remain realistic. I am not in favour to remove them one by one, but quadrant by quadrant. higher right Hémi-arcade, then left, then low, etc From the moment when this work is made “properly” I do not see any reason rational to take one year to remove about ten amalgams. Too many things maintaining the useless fears and resting on nothing tangible are known as on this subject, often with commercial purposes. Individual protection of the patient: wearing of a mask to coal to avoid the mercurielles vapor inhalation. This mask passes under the nose and recovers the eyes. It must be well posed and quite plated to avoid the escapes. To drink water with activated carbon (4 soup spoons per liter) and mouthwashes with the activated carbon before starting. This activated carbon by effect of pump will absorb possible mercury remains which would be present in mouth or in the digestive tract. Use of a device Clean-Up, very easy to implement at the end of the surgical vacuum cleaner. This small system frames the tooth on which the dentist works and avoids by syphoning projections in the oral cavity of dust of amalgam and mercury vapors in the oral cavity and thus in the lungs and blood. Cutting of the amalgam in sections when that is possible to avoid a pulverization and its consequences. That is difficult for the very small amalgams but possible thanks to strawberries to be routed very fine. Constant and abundant water vaporization to cool the amalgam and to avoid its heating. The emitted mercurielle vapor is thus reduced. Indeed mercury is a molten metal bird which evaporates starting from a heating effect beyond 40 degrees. Abundant rinsing of the mouth to the course and after the intervention: it is advised to proceed to a mouthwash with the activated carbon, then to make regular activated carbon catches thereafter during 6 days in order to collect mercurielles particles which would have been introduced. But in fact especially the inhaled vapors could be dangerous. The demounting of the elements quoted under lower part does not require precautions particular, they do not contain mercury. Metal crowns, bridges and other metals in mouth. They are made up various materials. They are always complex alloys. There is not less than one hundred different (according to the nature and the proportions of metals employed), used for the crowns. These crowns can be visible, with a metal aspect. They are today more the share of time covered with ceramics or resin and pass then unperceived for aesthetic reasons. One speaks then about céramo-metal crowns. All these matters return an electromagnetic echo whose characteristics depend on the nature of alloy. Those containing of nickel are always to avoid. They are generally out of titanium, sometimes used pure, sometimes alloyed with aluminium. They are sometimes but more rarely out of zirconium. Certain people have important susceptibilities for their electromagnetic purpose some is their constitution. It should be known that almost all the materials used in orthodontics, rings and wires, contain nickel. It is deeply regrettable that the children and teenagers are treated with these products with an age or they are in neurosensory formation and where they need all their energy. That more especially as a treatment of orthodontics, by the bousculement dental one that it causes, is in itself disturbing from a postural point of view. Nickel is always electromagnetically toxic. One thus calls the braces which are removed, those which one calls “the dentures”, used for certain cases of partial or total loss of teeth. They can be out of resin alone, fixed on the remaining teeth by “hooks” or out of resin “armed” with metal. All these metal alloys, in mouth, whatever they are, can return an electromagnetic echo, the gold alloys including. The physical characteristics of this emission depend on the nature of alloy. Their pathogenicity will depend on the susceptibility of the subject to this signal. This noxious effect is raised by the environmental electromagnetic waves. The electromagnetic effect of the amalgam as that of nickel are always harmful and it is for this reason that these materials are to be avoided. It can be composites which, as their name indicates it, are materials made up of two components at least: a joint-filling compound, consisted a resin of dental use which is component chemically active composite, and a hardener. The unit presents in the form of spineless individual deposited in the tooth by pressure to seal the cavity. The process by which the paste is transformed into hard material is due to the polymerization of this resin, process which modifies the structure of the elements and gives to the composite its final consistency. This polymerization takes place today by ultraviolet radiation, activation of molecules incorporated in the composite and sensitive to the light. They are not easily visible stops some because for aesthetic reasons their color is close to that of the tooth. The composite adheres to the tooth after application of an adhesive beforehand applied, i.e. made by joining. Their composition is difficult to know, being regarded as a trade secret by the inventors. More than 40 substances can constitute them. There exist also pivots made in such matters, resins or carbon and of which the effect is itself deeply noxious. There are the innumerable ones with the very different compositions. Sometimes feldspathic or quartzitic, these are those that one called another time of the porcelains and are primarily made up of oxide SiO2 silicon: 55 to 78% and of oxide Al2O3 aluminum. They are made up of new materials often resulting from space research. They are zirconias or oxide zirconium, or those which one calls low fusion. Very much used today for their aesthetic qualities and mechanics to replace metals in mouth, they vibratoirement speaking are very badly supported by a large number of people. The private clinic proves that they are responsible for serious disorders of health. They are color of the tooth and very difficult to recognize in mouth. These new products are of a great mechanical resistance One finds there in the case of zirconia a metal classified in rare earths (the rare earths are a family of metals), yttrium approximately 5%, hafnium oxide, approximately 2%, finally of the oxide D ” aluminium around 1%. Yttrium is present in most certain uranium ores, but never meets in a native state in nature. These ores are more or less radioactive. With the whole of all these products composing these materials posed today stops some, it is necessary to add the various chemical binders and the various dyes which allow an aesthetic optimization. They are composed of various metallic oxides like those of cobalt, iron or rare earths. Any matter emits a very weak electromagnetic radiation, but which exists, except with the zero absolute degrees. The characteristics of this radiation depend on the matter. When one removes an amalgam or a crown it is good to be concerned with material of replacement to make so that it better is well or supported than that extracted. It is necessary to test the electromagnetic compatibility of a dental material of reconstruction with the susceptibility of the oscillatory system of the subject which will carry it. An electromagnetic aggression will involve muscular tensions on the tonic system reflex and will disturb all physiological electro homeostasis. These tensions are put in obviousness by postural tests. There exists a great quantity of postural tests. I would evoke only tests very easy to realize and allowing to very easily highlight these induced tensions. From a medical point of view they are primarily tests “of amplitude of the articular movements”, called also postural tests. These tests result from a discipline of the official medicine, the posturology, taught in universities. There exists an university degree for this young science. Any matter posed in or on the human body, whatever its nature should be as a preliminary tested in order to check its electromagnetic compatibility with this one. That all the more if it is brought to be carried permanently. (Prostheses dental and different, coils, glasses) It is thus to some extent a Cultural revolution which is binding on us.